1 A None No Power Seat 1 A has limited legroom due to the positioning of the bulkhead. The proximity to the galley and lavatory may be bothersome. The tray table is in the armrest, making the armrest immovable and slightly reducing seat width. There is no floor storage during takeoff and landing. 1 B None No Power Seat 1 B is a reserved seat where no passengers can sit. This seat offers extra room for Europe Business passengers. 1 C None No Power Seat 1 C has limited legroom due to the positioning of the bulkhead. The proximity to the galley and lavatory may be bothersome. The tray table is in the armrest, making the armrest immovable and slightly reducing seat width. There is no floor storage during takeoff and landing. 1 D None No Power Seat 1 D has limited legroom due to the positioning of the bulkhead. The proximity to the galley and lavatory may be bothersome. The tray table is in the armrest, making the armrest immovable and slightly reducing seat width. There is no floor storage during takeoff and landing. 1 E None No Power Seat 1 E is a reserved seat where no passengers can sit. This seat offers extra room for Europe Business passengers. 1 F None No Power Seat 1 F has limited legroom due to the positioning of the bulkhead. The proximity to the galley and lavatory may be bothersome. The tray table is in the armrest, making the armrest immovable and slightly reducing seat width. There is no floor storage during takeoff and landing. 10 A None No Power Seat 10 A is an Economy Comfort seat that is missing a window. This seat has limited underseat legroom due to the presence of an electrical equipment box. 10 E None No Power Seat 10 E is a standard Economy Comfort seat. 10 F None No Power Seat 10 F is an Economy Comfort seat which has limited underseat legroom due to the presence of an electrical equipment box. 11 A None No Power Seat 11 A is an Economy seat which has limited underseat legroom due to the presence of an electrical equipment box. 11 F None No Power Seat 11 F is an Economy seat which has limited underseat legroom due to the presence of an electrical equipment box. 12 A None No Power Seat 12 A is an Economy seat which has limited underseat legroom due to the presence of an electrical equipment box. 12 F None No Power Seat 12 F is an Economy seat which has limited underseat legroom due to the presence of an electrical equipment box. 14 A None No Power Seat 14 A does not recline due to the exit row behind. This seat has limited underseat legroom due to the presence of an electrical equipment box. 14 B None No Power Seat 14 B does not recline due to the exit row behind. 14 C None No Power Seat 14 C does not recline due to the exit row behind. 14 D None No Power Seat 14 D does not recline due to the exit row behind. 14 E None No Power Seat 14 E does not recline due to the exit row behind. 14 F None No Power Seat 14 F does not recline due to the exit row behind. This seat has limited underseat legroom due to the presence of an electrical equipment box. 15 A None No Power Seat 15 A has extra legroom due to the exit, but it also has limited recline due to the exit row behind. This seat has limited underseat legroom due to the presence of an electrical equipment box. 15 B None No Power Seat 15 B has extra legroom due to the exit, but it also has limited recline due to the exit row behind. This seat has limited underseat legroom due to the presence of an electrical equipment box. 15 C None No Power Seat 15 C has extra legroom due to the exit, but it also has limited recline due to the exit row behind. This seat has limited underseat legroom due to the presence of an electrical equipment box. 15 D None No Power Seat 15 D has extra legroom due to the exit, but it also has limited recline due to the exit row behind. This seat has limited underseat legroom due to the presence of an electrical equipment box. 15 E None No Power Seat 15 E has extra legroom due to the exit, but it also has limited recline due to the exit row behind. This seat has limited underseat legroom due to the presence of an electrical equipment box. 15 F None No Power Seat 15 F has extra legroom due to the exit, but it also has limited recline due to the exit row behind. This seat has limited underseat legroom due to the presence of an electrical equipment box. 16 A None No Power Seat 16 A is a preferred seat and KLM charges an additional fee to sit here. There is extra legroom due to the exit row and the seat has a full recline. This seat has limited underseat legroom due to the presence of an electrical equipment box. 16 B None No Power Seat 16 B is a preferred seat and KLM charges an additional fee to sit here. There is extra legroom due to the exit row and the seat has a full recline. This seat has limited underseat legroom due to the presence of an electrical equipment box. 16 C None No Power Seat 16 C is a preferred seat and KLM charges an additional fee to sit here. There is extra legroom due to the exit row and the seat has a full recline. This seat has limited underseat legroom due to the presence of an electrical equipment box. 16 D None No Power Seat 16 D is a preferred seat and KLM charges an additional fee to sit here. There is extra legroom due to the exit row and the seat has a full recline. This seat has limited underseat legroom due to the presence of an electrical equipment box. 16 E None No Power Seat 16 E is a preferred seat and KLM charges an additional fee to sit here. There is extra legroom due to the exit row and the seat has a full recline. This seat has limited underseat legroom due to the presence of an electrical equipment box. 16 F None No Power Seat 16 F is a preferred seat and KLM charges an additional fee to sit here. There is extra legroom due to the exit row and the seat has a full recline. This seat has limited underseat legroom due to the presence of an electrical equipment box. 17 A None No Power Seat 17 A is an Economy seat which has limited underseat legroom due to the presence of an electrical equipment box. 17 F None No Power Seat 17 F is an Economy seat which has limited underseat legroom due to the presence of an electrical equipment box. 18 A None No Power Seat 18 A is an Economy seat which has limited underseat legroom due to the presence of an electrical equipment box. 18 F None No Power Seat 18 F is an Economy seat which has limited underseat legroom due to the presence of an electrical equipment box. 19 A None No Power Seat 19 A is an Economy seat which has limited underseat legroom due to the presence of an electrical equipment box. 19 F None No Power Seat 19 F is an Economy seat which has limited underseat legroom due to the presence of an electrical equipment box. 2 A None No Power Seat 2 A is a Europe Business bulkhead seat which has limited underseat legroom due to the presence of an electrical equipment box. 2 B None No Power Seat 2 B is a reserved seat where no passengers can sit. This seat offers extra room for Europe Business passengers. 2 C None No Power Seat 2 C is a standard Europe Business bulkhead seat. 2 E None No Power Seat 2 E is a reserved seat where no passengers can sit. This seat offers extra room for Europe Business passengers. 2 F None No Power Seat 2 F is a Europe Business seat which has limited underseat legroom due to the presence of an electrical equipment box. 20 A None No Power Seat 20 A is an Economy seat which has limited underseat legroom due to the presence of an electrical equipment box. 20 F None No Power Seat 20 F is an Economy seat which has limited underseat legroom due to the presence of an electrical equipment box. 21 A None No Power Seat 21 A is an Economy seat which has limited underseat legroom due to the presence of an electrical equipment box. 21 F None No Power Seat 21 F is an Economy seat which has limited underseat legroom due to the presence of an electrical equipment box. 22 A None No Power Seat 22 A is an Economy seat which has limited underseat legroom due to the presence of an electrical equipment box. 22 F None No Power Seat 22 F is an Economy seat which has limited underseat legroom due to the presence of an electrical equipment box. 23 A None No Power Seat 23 A is an Economy seat which has limited underseat legroom due to the presence of an electrical equipment box. 23 F None No Power Seat 23 F is an Economy seat which has limited underseat legroom due to the presence of an electrical equipment box. 24 A None No Power Seat 24 A is an Economy seat which has limited underseat legroom due to the presence of an electrical equipment box. 24 F None No Power Seat 24 F is an Economy seat which has limited underseat legroom due to the presence of an electrical equipment box. 25 A None No Power Seat 25 A is an Economy seat which has limited underseat legroom due to the presence of an electrical equipment box. 25 F None No Power Seat 25 F is an Economy seat which has limited underseat legroom due to the presence of an electrical equipment box. 26 A None No Power Seat 26 A is an Economy seat which has limited underseat legroom due to the presence of an electrical equipment box. 26 F None No Power Seat 26 F is an Economy seat which has limited underseat legroom due to the presence of an electrical equipment box. 27 A None No Power Seat 27 A is an Economy seat which has limited underseat legroom due to the presence of an electrical equipment box. 27 F None No Power Seat 27 F is an Economy seat which has limited underseat legroom due to the presence of an electrical equipment box. 28 A None No Power Seat 28 A is an Economy seat which has limited underseat legroom due to the presence of an electrical equipment box. 28 F None No Power Seat 28 F is an Economy seat which has limited underseat legroom due to the presence of an electrical equipment box. 29 A None No Power Seat 29 A is an Economy seat which has limited underseat legroom due to the presence of an electrical equipment box. 29 F None No Power Seat 29 F is an Economy seat which has limited underseat legroom due to the presence of an electrical equipment box. 3 A None No Power Seat 3 A is a Europe Business seat which has limited underseat legroom due to the presence of an electrical equipment box. 3 B None No Power Seat 3 B is a reserved seat where no passengers can sit. This seat offers extra room for Europe Business passengers. 3 E None No Power Seat 3 E is a reserved seat where no passengers can sit. This seat offers extra room for Europe Business passengers. 3 F None No Power Seat 3 F is a Europe Business seat which has limited underseat legroom due to the presence of an electrical equipment box. 30 A None No Power Seat 30 A is an Economy seat which has limited underseat legroom due to the presence of an electrical equipment box. 30 F None No Power Seat 30 F is an Economy seat which has limited underseat legroom due to the presence of an electrical equipment box. 31 A None No Power Seat 31 A is an Economy seat which has limited underseat legroom due to the presence of an electrical equipment box. 31 F None No Power Seat 31 F is an Economy seat which has limited underseat legroom due to the presence of an electrical equipment box. 32 A None No Power Seat 32 A is an Economy seat which has limited underseat legroom due to the presence of an electrical equipment box. 32 C None No Power Seat 32 C is a standard Economy seat, however proximity to the lavatory and galley may be bothersome. 32 D None No Power Seat 32 D is a standard Economy seat, however proximity to the lavatory and galley may be bothersome. 32 F None No Power Seat 32 F is an Economy seat which has limited underseat legroom due to the presence of an electrical equipment box. 33 A None No Power Seat 33 A is an Economy seat in the last row of the plane which may have limited recline. The close proximity to the galley and lavatory may be bothersome. This seat has limited underseat legroom due to the presence of an electrical equipment box. 33 B None No Power Seat 33 B is an Economy seat in the last row of the plane which may have limited recline. The close proximity to the galley and lavatory may be bothersome. 33 C None No Power Seat 33 C is an Economy seat in the last row of the plane which may have limited recline. The close proximity to the galley and lavatory may be bothersome. 33 D None No Power Seat 33 D is an Economy seat in the last row of the plane which may have limited recline. The close proximity to the galley and lavatory may be bothersome. 33 E None No Power Seat 33 E is an Economy seat in the last row of the plane which may have limited recline. The close proximity to the galley and lavatory may be bothersome. 33 F None No Power Seat 33 F is an Economy seat in the last row of the plane which may have limited recline. The close proximity to the galley and lavatory may be bothersome. This seat has limited underseat legroom due to the presence of an electrical equipment box. 4 A None No Power Seat 4 A is a Europe Business seat which has limited underseat legroom due to the presence of an electrical equipment box. 4 B None No Power Seat 4 B is a reserved seat where no passengers can sit. This seat offers extra room for Europe Business passengers. 4 E None No Power Seat 4 E is a reserved seat where no passengers can sit. This seat offers extra room for Europe Business passengers. 4 F None No Power Seat 4 F is a Europe Business seat which has limited underseat legroom due to the presence of an electrical equipment box. 5 A None No Power Seat 5 A is a Europe Business seat which has limited underseat legroom due to the presence of an electrical equipment box. 5 B None No Power Seat 5 B is a reserved seat where no passengers can sit. This seat offers extra room for Europe Business passengers. 5 E None No Power Seat 5 E is a reserved seat where no passengers can sit. This seat offers extra room for Europe Business passengers. 5 F None No Power Seat 5 F is a Europe Business seat which has limited underseat legroom due to the presence of an electrical equipment box. 6 A None No Power Seat 6 A is a Europe Business seat which has limited underseat legroom due to the presence of an electrical equipment box. 6 B None No Power Seat 6 B is a reserved seat where no passengers can sit. This seat offers extra room for Europe Business passengers. 6 C None No Power Seat 6 C is a standard Europe Business seat. 6 D None No Power Seat 6 D is a standard Europe Business seat. 6 E None No Power Seat 6 E is a reserved seat where no passengers can sit. This seat offers extra room for Europe Business passengers. 6 F None No Power Seat 6 F is a Europe Business seat which has limited underseat legroom due to the presence of an electrical equipment box. 7 A None No Power Seat 7 A is a Europe Business seat which has limited underseat legroom due to the presence of an electrical equipment box. 7 B None No Power Seat 7 B is a reserved seat where no passengers can sit. This seat offers extra room for Europe Business passengers. 7 C None No Power Seat 7 C is a standard Europe Business seat. 7 D None No Power Seat 7 D is a standard Europe Business seat. 7 E None No Power Seat 7 E is a reserved seat where no passengers can sit. This seat offers extra room for Europe Business passengers. 7 F None No Power Seat 7 F is a Europe Business seat which has limited underseat legroom due to the presence of an electrical equipment box. 8 A None No Power Seat 8 A is an Economy Comfort seat which has limited underseat legroom due to the presence of an electrical equipment box. 8 B None No Power Seat 8 B is a standard Economy Comfort seat. 8 C None No Power Seat 8 C is a standard Economy Comfort seat. 8 D None No Power Seat 8 D is a standard Economy Comfort seat. 8 E None No Power Seat 8 E is a standard Economy Comfort seat. 8 F None No Power Seat 8 F is an Economy Comfort seat which has limited underseat legroom due to the presence of an electrical equipment box. 9 A None No Power Seat 9 A is an Economy Comfort seat which has limited underseat legroom due to the presence of an electrical equipment box. 9 B None No Power Seat 9 B is a standard Economy Comfort seat. 9 C None No Power Seat 9 C is a standard Economy Comfort seat. 9 D None No Power Seat 9 D is a standard Economy Comfort seat. 9 E None No Power Seat 9 E is a standard Economy Comfort seat. 9 F None No Power Seat 9 F is an Economy Comfort seat which has limited underseat legroom due to the presence of an electrical equipment box. Each Europe Select and Economy Comfort seat is equipped with a 110V AC power port. 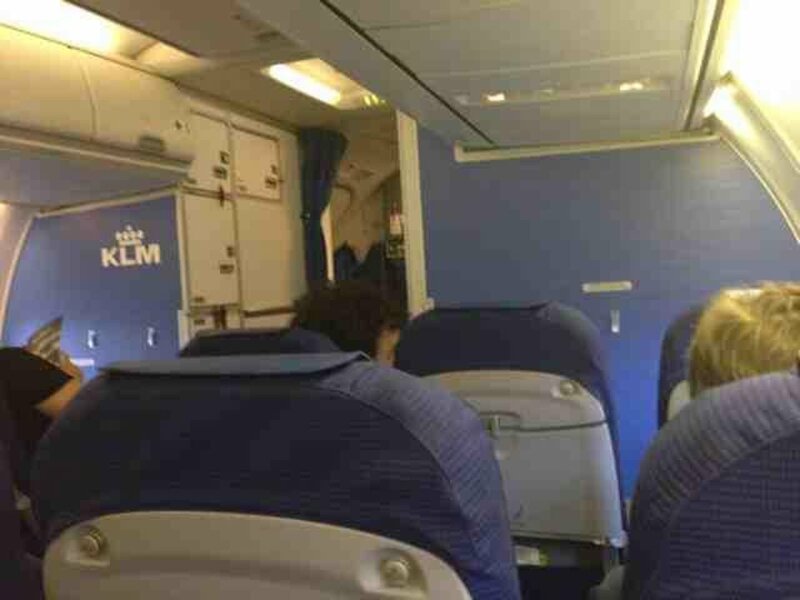 KLM charges extra for exit row seats in economy class. Economy Comfort seats can be reserved for $27 - $214 (20-160 EUR) or by using your Flying Blue KLM miles. Simply an old cattle car, seats show a lot of wear and tear. Pitch is ok, width is ryanair style. Food and service were great tho. Cattle car plane, the whole interior is outdated and needs a refurbishment urgently. Seats are barely wide enough and show a lot of wear and tear. Food and service were great tho. This plane is simply a cattle car. 30" pitch in coach is usually flown by discount airlines. 33" pitch in business is likely the smallest in the industry. All rows are 3x3 and in business class they leave the middle seats empty. So business class seats are really coach seats with the middle seats empty. Food and service in business wasn't much different than coach. KLM flies 1 versions of Boeing 737-900.